E. E. Cummings was an american poet, painter and author. His body of work encompasses approximately 2,900 poems, two autobiographical novels, four plays and several essays, as well as numerous drawings and paintings. He is remembered as an eminent voice of 20th century English literature. 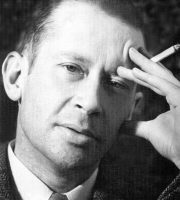 Read the most famous and best poems of E. E. Cummings below. Cummings' poems often deals with themes of love and nature, as well as the relationship of the individual to the masses and to the world. His poems are also often rife with satire.